25,000 tickets have been picked up during early sales for the meeting of Notre Dame and the US Naval Academy in September. THE AMERICAN FOOTBALL game due to be staged at the Aviva Stadium later this year has sold 25,000 tickets before they have even become available to Irish fans. 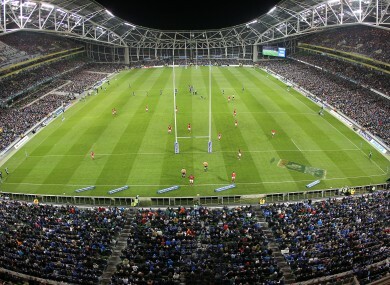 The University of Notre Dame will play the United States Naval Academy at Lansdowne Road on September 1 and early sales from the States have seen half of the stadium already filled. The remaining tickets will go on sale to the Irish public on March 20 and Naval Academy Director Chet Gladchuck said: “The response from the US and corporate markets have been phenomenal and we hope the Irish will also come out in force to fill the Aviva Stadium for this great spectacle. As part of the ‘Global Ireland Football Tournament’ (GIFT), Parnell Park and Pairc Tailteann will also host games. Tickets, which start at €35, ranging up to €90, are available to purchase online through www.ticketmaster.ie, by phone on 0818-719300 and in Ticketmaster outlets nationwide. Email “Keen interest in American football fixture at Lansdowne”. Feedback on “Keen interest in American football fixture at Lansdowne”.